HALIFAX -- Moments before the armistice ending the First World War took effect on Nov. 11, 1918, a sniper's bullet sliced the morning air. It struck a Canadian soldier in the chest as he emerged from the doorway of a house in a small Belgian village. Pvt. 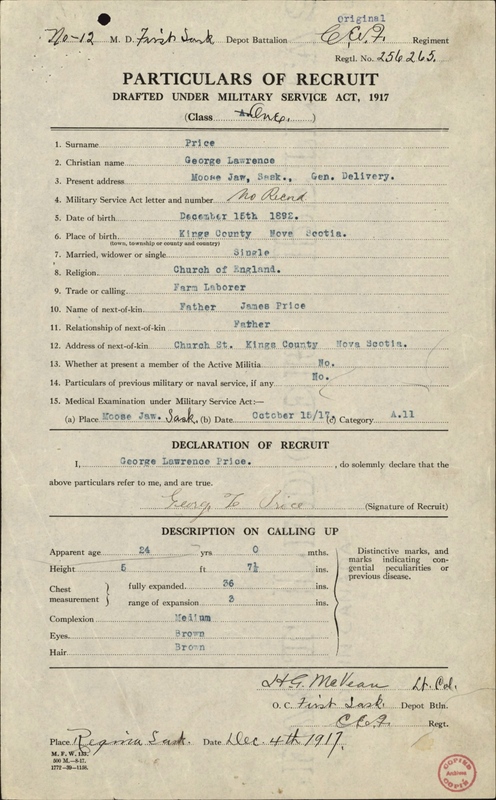 George Lawrence Price died minutes later at 10:58 a.m. -- a mere two minutes before hostilities ceased. 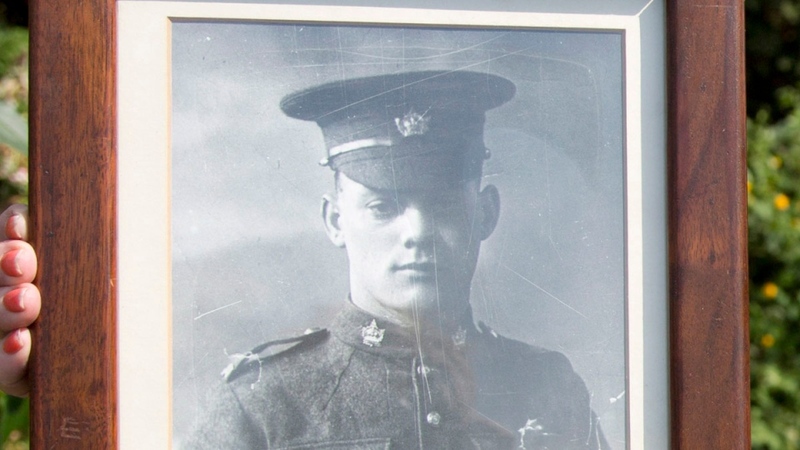 It's unclear whether the 25-year-old was aware the war was so close to being over when he and five other members of 'A' Company, the 28th Battalion of the Saskatchewan North West Regiment, decided on their own to search a series of houses for Germans in Ville-Sur-Haine, east of Mons. "They had heard rumours for months that maybe the war was going to come to an end, but if you are a soldier on the front lines you tend to take that stuff with a grain of salt," said Ken Hynes, curator of the Army Museum Halifax Citadel. "So George was doing his job as he saw it." He is interred in a cemetery in Belgium not far from the war's first British Empire casualty, Pvt. John Parr of the 4th Battalion Middlesex Regiment. 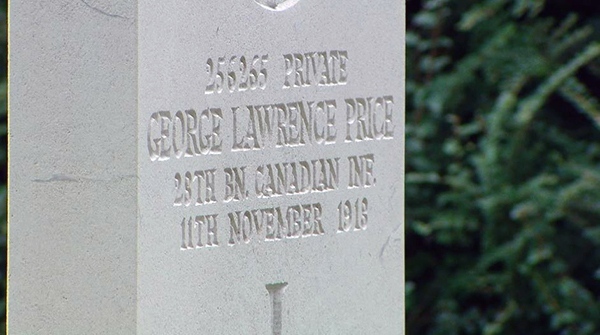 Price's story has remained ingrained in the lore of succeeding generations of his surviving family, according to his niece, Beverly McLean, of Kentville, N.S. "My mom was his second youngest sister and from the time I was a little girl that's all I heard was about Uncle George," McLean said following the recent premiere in Halifax of a short documentary film about Price. "My mom just worshipped him and she named her son George after Uncle George." 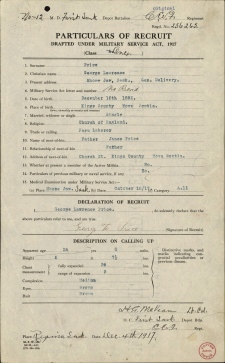 According to an eyewitness account by Goodmurphy in an interview conducted after the war, he said that he went back to his company's position and told a major that Price had been killed. "Oh Jees did he blow a fuse," Goodmurphy recalled. "The war is over, the war is over, he (the major) said. I said, well I can't help that." Goodmurphy also reported the major as saying "What the hell did you go across there for? We had no orders to go across there." But Goodmurphy's account noted the reconnaissance party "never even thought about the war being over then," adding that "we didn't always get orders to do everything that we did." Most battalions got word no later than 9:30 a.m. "and they went to ground" Cook said. 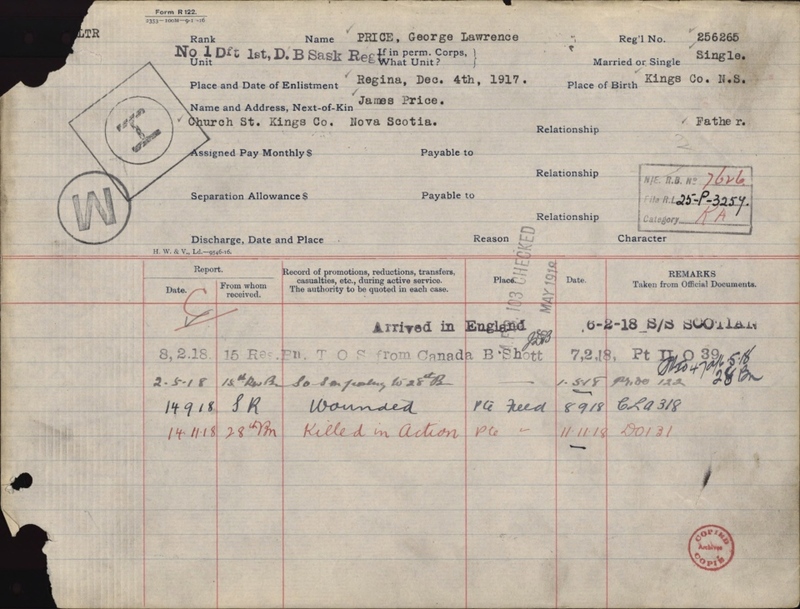 "Still, there were patrols along the front including George Price's." 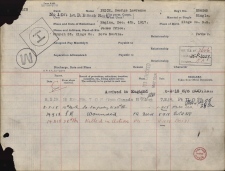 Hynes said whether Price received the specifics of those orders is unknown, and the same doubt about whether all soldiers knew how close war's end was can likely be extended to the German soldier who shot him. "One can speculate about whether the German soldier knew this -- who knows?" said Hynes. "That information is lost to the mists of time." "It's very difficult for people to wrap their minds around the mass numbers of casualties that were taken in the Great War," he said. 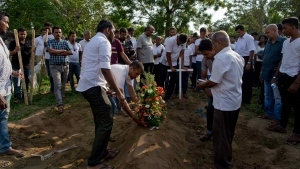 "But if you can focus on a single person then perhaps you can make a connection with the sorrow and the tragedy." Price's grand niece, Rhonda McLean, said she was fascinated by his story from a young age. "His photo hung on my grandmother's living room wall, and so he was always present in any of the conversations going on in the family in a funny way because his eyes would follow you no matter where you were sitting in the room," she said. McLean said it was only as she grew older that she began to grasp the meaning of her great uncle's death in a more profound way. "It's a story of incredibly bad timing," she said. "And now of course, that's what tends to hook most people when they hear this story. He nearly made it home and he didn't, and so he's become a real representative in a way for all of those who didn't come home."